The Rabbits Need Your Help! 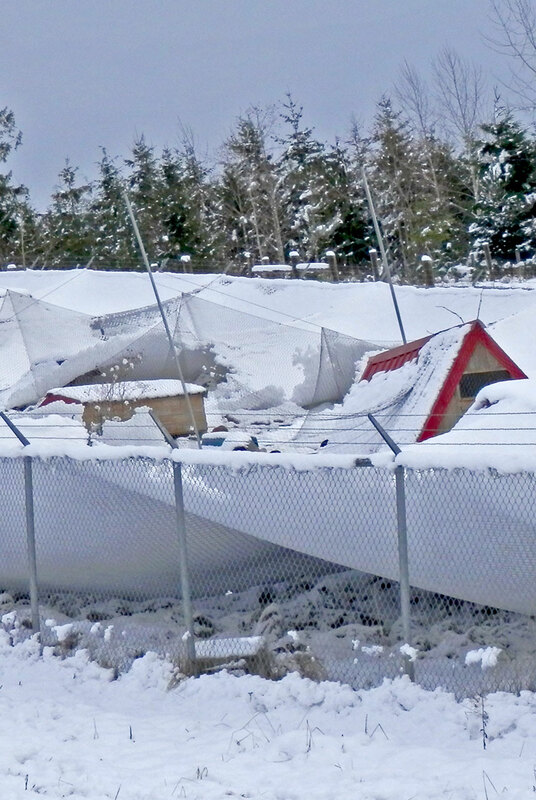 Our netting that protects the rabbits from predators was damaged by snow this winter. 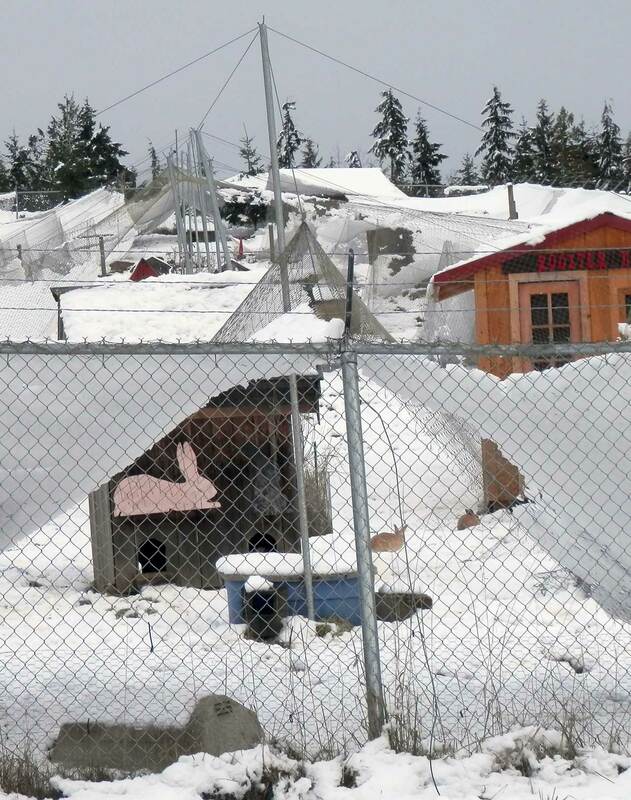 We sent out the following calls for help and your generosity provided the funds needed to replace this half acre of netting that shelters the rabbits from the predators that live in the foothills of the Olympic mountains. This fundraiser is no longer active. The new netting was installed on June 21st, 2017. 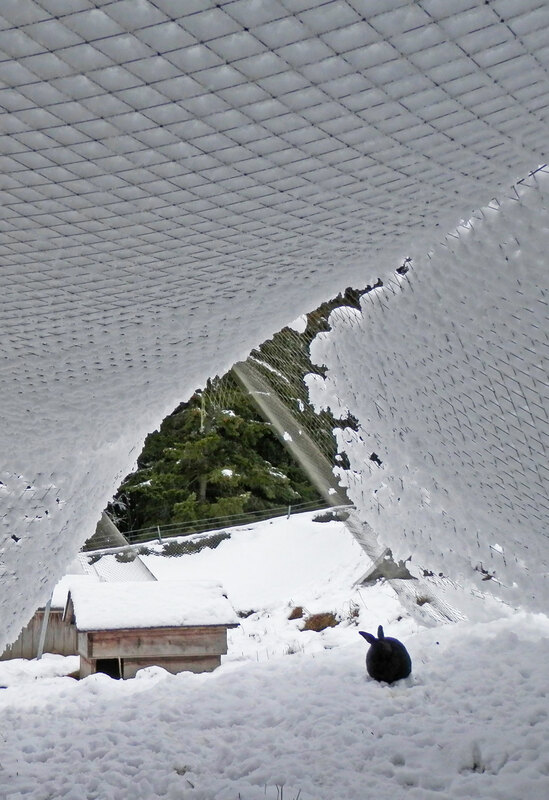 The severe winter snow storms have torn and collapsed the entire overhead protective netting above the rabbit enclosure. Funds are desperately needed to install new and improved netting to cover the unique, one-half acre enclosure. All the rescued rabbits are easy targets for a wide range of raptors, hawks, falcons, vultures, eagles and owls that frequent the sanctuary throughout the year some of which will be nesting increasing the vulnerability of the rabbits. Thanks to the concern and generosity of so many of you, we have reached our half-way mark to raise the needed $9,500 to replace the entire netting of our one-half acre rabbit enclosure. Severe winter storms have damaged the netting beyond repair making the rescued rabbits easy targets for the wide range of raptors that live and frequent the sanctuary year-round. To once again have back in operation our totally predator-proof rabbit enclosure speaks to our humanity, human values and practices toward such gentle creatures that are a symbol in many cultures, especially for children. Our rescued rabbits have come from all over and most have lived their entire lives in wire cages, in commercial operations, with backyard breeders, at hobby farms or abandoned in city parks. For them to have the chance to experience freedom in a large, secure natural environment is a worthwhile goal that we can all share and make happen with your help. Remember all donations are tax deductible and we will gladly provide a receipt. We want to extend how grateful we are to so many of you for your continued commitment and generosity in time of need to replace the collapsed netting in the rabbit enclosure due to severe winter snowstorms. Thanks to you, we are proud to report we have received nearly $6,000 and need only $3,500 more to present to the netting company so they can begin and complete the project on our half-acre rabbit enclosure. The rabbits we have rescued from all over will be able once again live out their lives in a totally safe, predator-proof environment. We are so grateful for everyone who continues to support the goal of installing predator-proof replacement netting for our rabbit enclosure. It couldn’t have come at a better time as we, along with rescue groups, shelters and human societies, will be getting an increasing number of bunnies due to irresponsible parents purchasing live bunnies for Easter. The novelty soon wears off with bunnies stuck in small cages that have to be cleaned regularly and added responsibilities to keep them healthy. The end result is relinquishing their responsibility to someone else or simply releasing them in the wild with no chance of survival. Hooray! The Rescued Rabbits and Roosters are Safe! Pacific Northwest Products finished installing the overhead netting on the entire huge rabbit and rooster enclosure that had torn apart beyond repair due to the severe winter with one snow storm after another. Due to a better design and larger mesh size, it should withstand another severe winter. This much needed project could not have taken place if it was not for the many generous donors who made it happen. We are so grateful for all your support along with the rescued rabbits and roosters who now live in a natural habitat that is totally predator-proof once again. Now that they are taken care of, we have to concentrate our efforts on preparing for another winter with increased costs of hay and feed for all the others. The before and after pictures tell it all. The rabbit area after the snow melt. The new netting installed. Thank you!